Sea conditions were mild, however a wave rolled the vessel near the shore. Three men were thrown from the boat into the water. They were all wearing lifejackets and managed to swim safely to land, though one of the men struggled to get to shore. Fortunately the incident was witnessed by a Parks Victoria ranger who called an ambulance. The trio was treated by paramedics and evacuated by Air Ambulance due to the tricky terrain. Regardless of your swimming ability, cold water and wave action will drastically affect your ability to cover any meaningful distance. A lifejacket will assist you in catching your breath and making decisions about your next steps to getting to safety. Victoria's coastal waters range from about 9.5°C in midwinter to about 22°C in midsummer. When a person falls into water less than 15°C the first reflex is to gasp and then hyperventilate, during which it is extremely difficult to hold breath. The heartbeat may become very fast and irregular during this time. There is a high danger of drowning if the head is not kept above water. It may take several minutes to regain control of breathing and be able to climb back aboard if this remains possible. Strength and coordination weaken quickly in cold water, typically in 10-15 minutes, so it is important to inflate lifejackets and rafts, and set off an emergency position indicating radio beacon (EPIRB) quickly for the best chance of survival and rescue. Prepare flares and signals next, so they are easy to access and deploy when help arrives. Activity such as swimming will increase heat loss. 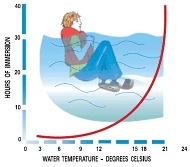 Hypothermia commence when the body core temperature reduces, typically within an hour of immersion. Prepare for the worst: Learn about safety gear, practising man overboard drills and other ways to maximise your chance of survival at transportsafety.vic.gov.au/msv/emergency.